Our Non-Chlorine Oxi-Shock by Haviland is a full strength product. 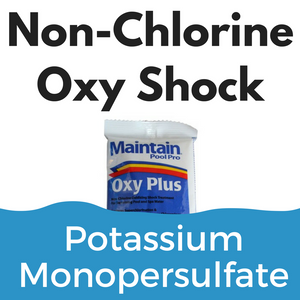 Many online stores sell only a cut or blended version which has way less potassium monopersulfate in it resulting in a poor quality pool shock. No need to worry with Havilands full strength pool shock. Shock and Swim in less than 15 mins! This product will not raise your chlorine level. Also will not stain or bleach your pool liner. DOSAGE: 1 lb per 10,000 gallons of swimming pool water.